(Bloomberg) -- Turkey’s central bank sought to calm investors as the nation’s assets fell before an election that will be the first test of President Recep Tayyip Erdogan’s popularity since he tightened his grip on power last year. The regulator took the unusual step on Thursday of announcing via the state news agency that its net foreign-exchange reserves had risen $2.4 billion over the past week to $28.6 billion. In the prior three weeks, the figure fell by over $9 billion based on Bloomberg calculations using the central bank fixing. “The central bank decisively continues its policy to strengthen reserves," central bank Governor Murat Cetinkaya said in comments carried by Anadolu news agency. Turkish reserve data are typically released with a one-week lag. 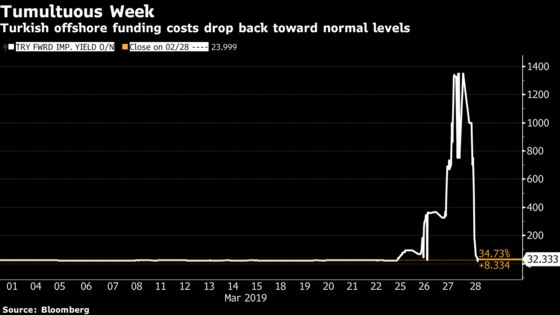 Speculation Turkey was using reserves to keep the lira from sliding before the March 31 vote prompted investors to dump the currency last week. To prevent that from worsening, Turkey then orchestrated an offshore cash crunch to make it virtually impossible for foreign investors to close their lira positions this week. While the lira is still up 4 percent since Monday, it depreciated 3.6 percent to 5.5303 per dollar by 3:54 p.m. in London. Turkish bonds also extended their decline, with the yield on two-year notes jumping 76 basis points to 21.21 percent. There were also signs offshore funding conditions are heading back toward normal levels after surging past 1,000 percent yesterday. Under government-backed measures, banks were pressured not to provide cash to overseas funds trying to close their lira positions using the offshore swap market, people with direct knowledge said this week. Investors who wanted out of their lira positions were forced to instead sell other Turkish assets—like bonds and stocks—to get the cash they need to close those trades. After three days of turmoil, offshore funding conditions eased on Thursday, with the funding rate falling to 32 percent, still above its one-year average. Turkey’s interference in the currency market has rattled fund managers, some of whom said they were rethinking their investments in the country. "There’s an important confidence issue," said Esther Law, a senior investment manager for emerging-markets debt at Amundi Asset Management in London. "Investors will be wary of encountering the same situation, where they are unable to liquidate Turkish assets. We will also see a weakening appetite for foreign banks to finance to Turkish companies." The March drop in reserves was one of the reasons cited by JPMorgan Chase & Co. a week ago when it predicted the lira would decline, triggering a selloff that pushed the currency down 5.1 percent in a single day on Friday. That provoked a backlash from Turkish authorities, with Erdogan threatening to punish bankers deemed responsible for speculating against the currency. On Thursday, the president blamed fluctuations in the exchange rate on "operations by the U.S. and the West to corner Turkey," during a meeting with young people in Ankara where his AK Party will face a competitive race in municipal elections this weekend. He said Turkey had foiled attempts to target foreign exchange and interest rates. The lira has been prone to sharp fluctuations in recent years as Erdogan tightened his grip on power, leading investors to question the central bank’s independence because of his repeated calls for lower interest rates even amid runaway inflation. Policy makers last used reserves to defend the currency in 2014. While the vote this weekend is only to decide on who will lead Turkey’s cities, Erdogan has been on the campaign trail to try to bolster support for the ruling party. Since he assumed sweeping powers last June by abolishing the role of prime minister, the economy has fallen into a recession, inflation has soared and opposition parties have aligned efforts to undermine his authority. The nation’s equity index gained 0.3 percent on Thursday, trimming its weekly loss to 7.7 percent.